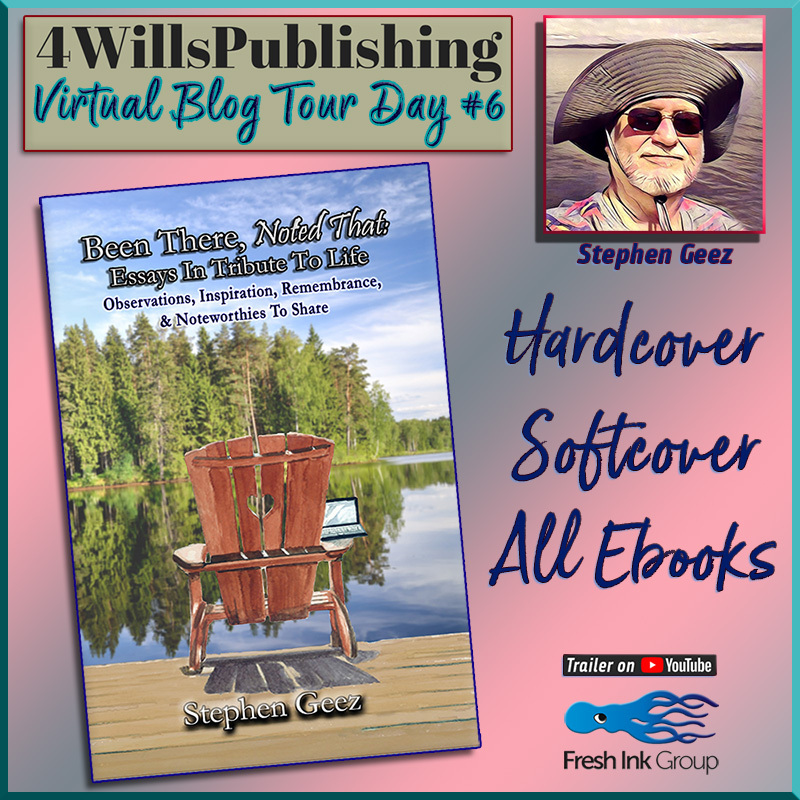 Stephen Geez on his Been There, Going Again Blog Tour! Greetings, cherished souls! Welcome to the sixth stop on my 4WillsPublishing Blog Tour celebrating the re-issue of my memoir-shorts, Been There, Noted That: Essays in Tribute to Life.It has updated cover, new graphics, new book trailer, and now a first-ever jacketed hardcover edition. The book’s ruminations range from light and humorous to heartbreakingly poignant, but all spring from my own experiences. Thanks for visiting, trying this sample, and commenting! Springtime brings renewal. The countryside thaws, flowers and trees bud, and bitter cold yields to the warm gusts of a new summer in that inexorable reaffirmation of life. This is the time, when conditions are just right, for flying a kite. Many springtimes ago my little sister, Tanya, saved her allowance and bought a kit for building one of these aeronautical wonders. Only about eight or nine at the time, she methodically assembled it without assistance or advice, then set it aside, anxiously monitoring the weather, waiting for the perfect day. It arrived one afternoon when a patch of rain clouds drifted beyond the horizon to reveal azure sky, sunshine bathing our neighborhood in its warm glow, a steady breeze stirring from the south. Tanya gathered every spare roll of string and twine she could find, then carried her prized pink diamond-flyer out to the driveway and launched it high. Navigating between tree-tops, avoiding the hazards of power lines and utility poles, she carefully played out the line, hoping to float hers higher and farther than any kite had flown before. She watched proudly as it continued to lift effortlessly into the air, her ersatz explorer tugging gently at its reins, seeking the freedom to sail where it may. I loitered nearby, certainly too old for such childish games, but ready to help her tie another roll when the first played out. Of course, I lingered for a while in case she might succeed in needing a third. And still, the kite climbed. By the time she added a fourth roll, an audience of neighborhood kids had started to gather, some contributing more string to the cause, all applauding Tanya’s remarkable feat. Mom came out to assess the commotion, then pulled me aside and quietly cautioned that soon the stress would be too much, that mere string would surely break and leave Tanya heartbroken. Still, to our little aeronaut, testing the limits of the sky had proven more important than any certainty of retrieval. I can’t say how many rolls were pressed into service that day, but I do recall that kite fading so far into the distance that latecomers would need binoculars to confirm what we already knew. One boy set out on his bicycle, pedaling furiously northward, returning later to confirm that Tanya’s kite hovered in sight of the big cemetery with manicured lawns and a chapel and turtle pond, where geese gather to stand sentry over loved ones lost. Eventually, the sky darkened, the audience drifting away for suppers and television and bedtimes. It took quite a while, but Tanya, determined to bring the explorer home, managed to wind all that string and retrieve her great pink kite, remarkably intact and unscarred. If only that delicate assemblage of paper and wood and torn rags could share its glory, Tanya’s would boast one of the finest kite tales ever told. I don’t know what happened to that kite. Our time with such ephemeral toys is inevitably short. Many are put away and forgotten, others broken or lost to those hazards that lurk at the fringes of everyday life. A few even manage to break free, never to be seen again, hopefully continuing their journeys on their own terms, in their own time. In the coming years, we learned to mark the advent of spring with Tanya’s launch of each new kite. Sunny days offering brisk breezes would surely find her clutching a roll of twine, eyes to the distance, a rag-tailed flyer dancing against that vivid backdrop of blue. But even little girls grow up, and Tanya started having to fit her picnics and campouts and kite-flying jaunts between the demands of a busy career. We especially cherished those rare trips to visit our parents at their home on a lake in the mountains. We’d go boating with Dad, and she’d lean out the bow, eyes closed, her arms catching the wind. We’d feed geese with Mom, and Tanya would gaze wistfully as eventually, inevitably, they would fly off to disappear against the blinding blue sky. And she would cajole me into hiking with her to the natural bridge, climbing ridges until we towered over the valley, then pausing to watch cascading waterfalls crash into stair-step pools below. She always stood at the precipice and tilted her face up to the sun, and at those moments I knew that if I could give my sister anything in the world, it would be a magnificent pair of wings. But like all seasons, springtimes must pass, and when Tanya was twenty-eight years old one of those hazards lurking at the edges of everyday life proved too much. The sun had set on a bitter winter day, and in the darkness her car skidded across a patch of black ice. The string broke that night, and I lost my little sister, the beautiful young woman who loved animals and people, the little girl who never gave up, the magically buoyant soul who always found her wind. Hundreds attended her funeral, a tribute from those lucky enough to have known and loved her. I don’t think that warm spring day when she’d decided to fly her pretty pink kite was mentioned; so much had happened in the years since too many poignant moments to recall. She was buried there in the cemetery with the manicured lawns, close to the chapel and turtle pond, where geese gather to stand sentry over loved ones lost. Some say death is a part of living, not a moment to fear. Hopes and dreams, no matter how big or small, give us the impetus to reach. There will always be risks and hazards inherent in all we try to achieve, in every place we venture, whenever we dare to share, and in those times we test the boundaries to see, if only for that moment, how it feels to soar. I’m proud that my sister always lived on her own terms, never afraid to play out a little more string, eternally reaching for the sky. I miss you, Tanya, and that never changes as the years breeze ever faster by, even as the springtimes come and go in that inexorable reaffirmation of life. Your only tethers to this world now are the memories twined among the people whose hearts you touched, each contributing another roll. I’ll never let go of my end, so you fly as high and as far as you ever imagined. Bathe the world in your sunshine, and my love will be your wind. *For each day: 1 hardcover edition ofBeen There, Note That. Oh my, Stephen, what a wonderful legacy your sister left you. Thanks for sharing your cherished memories with us. Stephen, this is a beautiful and thoughtful story. My heart is with you and your family. I lost a brother whom I admired and adored and the pain, while it lessens, never really goes away. I had to have an investigation done before I could find my peace because I realized I was grieving for many years. There was never any closure. So I hope you found your closure. Then all will be well. I have a book “Fantasy Patch” that I won from you. Perhaps it is time for me to pull it out and read it. Thank you so much for sharing this poignant story with us. Thank you for the kind sentiments, Shirley. I’ve often said you never really get over such loss but rather in time you just grow more used to it, carrying it with you but summoning it up less and less often. Maybe it’s time to try Fantasy Patch–or this book. Good reading! Thanks for the comment, and thanks to Joy for sharing her blog with us today. I am happy to have you, Stephen. What a beautiful tribute to your sister who was gone from here too soon. I am very sorry for your family’s loss. I could see her kite flying and her soul soaring with it. I love how she is still tethered to you now. Thank you for sharing her with us. Wonderful thoughts, D.L. Thanks a lot. This was such a moving short story. I love the way you weave the story, beautifully as you show her love for life, and the pain of your loss, which I am so sorry for you and the many who knew her wonderful spirit. You paid her a great tribute and it shows just how much you love her by the way you painted such a beautiful picture of her life. Thank you for sharing! Thank you for the generous thoughts. the throes of an unexpected event. This heartfelt tribute to an adored sister is moving beyond your moving words because of your ability to bring the page alive. I shed some tears. “BEEN THERE, NOTED THAT: Essays in Tribute to Life” (which I bought a while ago). Thanks, S.G., for taking me on yet another journey way beyond the ordinary. And thank you, Helen, for coming along. I remember reading this story almost 20 years ago. It is the one that really stayed with me. Great memory, Stephen. It’s been that long. Wow. Thanks for revisiting it. Another beautiful piece, Stephen. Thank you for sharing Tanya with us. Joy, so appreciate you hosting. Thanks for taking the time to learn about her. And thanks for the kind words. Stephen, this is my favorite one yet. A beautiful and touching account and an amazing tribute to your sister. Fantastic imagery too! ❤ Thanks for hosting, Joy!